Come in, relax, and spoil yourself with a manicure, pedicure, or a fresh new nail design. Our sister store, Treat Your Feet, won the 2015 Atlanta Magazine Award for Best Thai Massage. Treat Your Nails gives the same quality service. We give our clients the highest level of relaxation and nail care. Our classic clean yet modern design evokes a zen energetic and tranquil atmosphere to allow you to fully enjoy your beautification and relaxation. You will notice the welcoming reception area and sparkling baguette shaped crystal chandeliers that light up our unique glass beaded barrel and coffered ceilings. Our pedicure room showcases 16 state-of-the-art “Human Touch” massage chairs with adjustable reclining and leg room positions. It features gorgeous jewel tone foot spa to ease away your aches and pains. Each one of our cozy pedicure chairs has a USB charging station for your mobile devices. Our dedicated manicure stations feature comfortable plush chairs with arm rests. Melt away your stress, aches, and pains with our amazing treatment. Start off with a relaxing soak in a mineral sea bath, followed by a callous treatment, gentle exfoliating scrub, sugar scrub massage, hydrating foot mask with warm towel wrap, a hot stone oil massage, paraffin treatment, moisturizing scented lotion and polish of your choice. 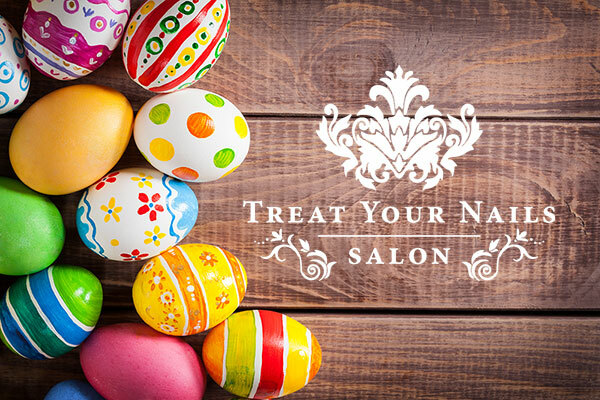 Treat Your Nails will be closed on Sunday, April 21st.